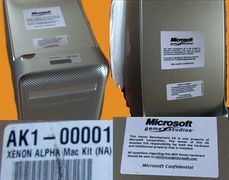 The Alpha Xenon Development Kit (XeDK) was an Apple PowerMac G5 running an early version of the XDK software that was sent to early developers for the Xenon console. The earliest evidence of the Alpha XeDK was around October 2003 when they first started arriving on Microsoft's Redmond campus. 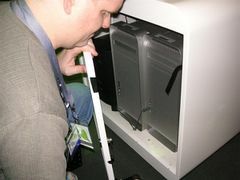 The Alpha XeDK was replaced by the near-final Beta XeDK console after which, leftover PowerMac G5's were resold to full time Microsoft employees. 7.1 Did the Alpha XeDK have a special BootROM or OpenFirmware version? 7.2 Were the Alpha XeDKs liquid cooled? 7.3 What controllers work with an Alpha XeDK? 7.4 Is a network card required for the Alpha XeDK to operate? 7.5 Is there a foolproof way to identify whether an Alpha XeDK is fake? 7.6 Can the Alpha XeDK connect to Xbox Live or Partner Net (PNET)? 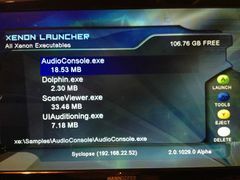 7.7 Can the Alpha XeDK run original Xbox games? 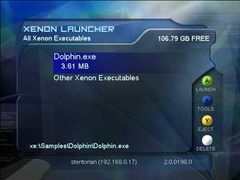 7.8 Can the Alpha XeDK run Xbox 360 games? 7.9 Is there an SDK for the Alpha XeDK? 7.10 Does the Alpha XeDK have a retail dashboard? 7.11 Is there a remote recovery for the Alpha XeDK? 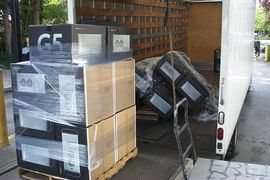 Some of the earliest documentation of the Alpha XeDK dates back to October 2003 when Xerox contractor Michael Hanscom shared a picture of a truckload of PowerMac G5s arriving on Microsoft's Redmond campus. Hanscom was later fired for posting the photos to his online blog. The Alpha XeDK was used for development of early Xbox 360 titles including Crackdown, Condemned, Kameo and Full Auto. Development of these titles was later moved to Beta hardware and eventually, final XDK hardware before being released. 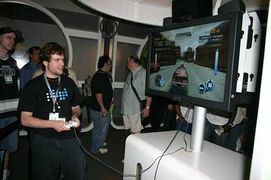 The Alpha XeDK was used for all demos at E3 2005. 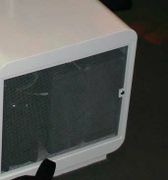 Even though the final case design was being shown, all of the locked kiosk cabinets contained the PowerMac G5 Alpha XeDKs and wired controllers due to the lack of RF board. When Microsoft moved all development to the Beta XeDK, the Alpha XeDKs were resold to full time Microsoft employees for $300 USD with a limit of 1 per employee. Although these kits all had the Microsoft Game Studios stickers on them, most were wiped and reinstalled with Mac OS X for personal use. Despite most being wiped, a couple of Alpha XeDKs with intact software were obtained by a community member who refused to share the drive contents. The previously mentioned user claims that they were later sold to an anonymous private party. These were the only publicly-known working Alpha XeDKs. The Alpha XeDK hardware is a standard Apple PowerMac G5 PCI-X or PCI-X 2 A1047 model with an upgraded video card and an additional Intel Pro100+ network card installed. The A1047 PCI-X model uses an earlier Dual-Processor (DP) PowerPC 970 2.0GHz CPU configuration. PCI-X 2 Alpha XeDKs assembled after June 2004 used a Dual-Processor (DP) PowerPC 970fx 2.0GHz CPU configuration that was identical but with a 90nm manufacturing process (an upgrade from the 130nm process used in the previous 970 model). Out of 8 possible PC3200 memory slots, 2 memory slots are populated with 256MB DIMMS for a total of 512MB of DDR RAM. The graphics card is the only difference between an Alpha 1 and Alpha 2 XeDKs. The Alpha 1 configuration uses an R300 based ATI Radeon 9800 Pro 128MB and is not supported by later recoveries. The R420 based ATI Radeon X800 XT was sent out to developers in order to update to Alpha 2. The X800 XT features double the VRAM of the previous R300 based card and is required to run later recoveries. Both cards are AGP based Mac-edition cards. An Intel Pro100+ PCI networking card is installed in the top slot of the PowerMac G5 to handle networking for the XDK (the PowerMac G5's internal networking port is Gigabit and is not recognized by the XDK software). A stock 160GB Seagate SATA 7200RPM provided by Apple is used to hold the XDK recovery and any game builds. Original Alpha XeDKs have a serial number starting with "XB", merely a coincidence as XB just denotes the assembly plant as Elk Grove. The hard drive is an Apple Partition Map formatted drive with a 10MB HFS partition at the beginning dedicated for booting. The OpenFirmware BIOS on the PowerMac can only load .elf files from an HFS partition. Two files are present on the 10MB XeBoot partition; a 1MB ELF file called xboxroma.bin and a CHRP boot file called XEBOOT that is used by OpenFirmware to automatically load the xboxroma.bin file. The rest of the drive is FATX formatted. Although there may be an earlier version of the Xbox 360 SDK, Xbox Neighborhood can be used from the latest Xbox 360 SDK in order to transfer files and execute basic commands (later commands such as screenshot don't work). Alpha 1 XeDKs were the original version of the Alpha XeDK. The only difference from the Alpha 2 kit was the older R300 based ATI Radeon 9800 Pro graphics card with only 128MB of video memory. The R300 based Alpha 1 video cards were phased out during Fall 2004 and were no longer supported after February 2005. They can not be used to install or boot an Alpha 2 recovery. Alpha 2 XeDKs were upgraded versions of the Alpha 1 XeDKs with R420 based ATI Radeon X800 XTs installed. These cards were sometimes just referred to as "256MB video cards" within Microsoft's internal documentation. 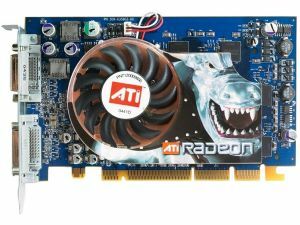 The Alpha 2 video cards were sent out to developers starting on October and November of 2004. 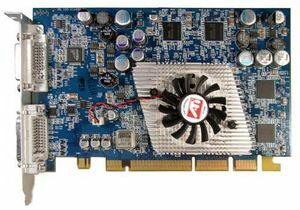 The R420 based video card became mandatory from February 2005 onwards. In May of 2005, developers were able to use the full 512MB of system memory with the intention of 256MB being dedicated for the graphics processor. If developers exceeded their graphics 256MB limit then extra resources were stored within the AGP card's VRAM. 0198 - Seen running on a Alpha XeDK named "stentorian"
0417 - Mentioned in the 0615 remote recovery. Possibly the last 32 bit kernel. Did the Alpha XeDK have a special BootROM or OpenFirmware version? No, although the Alpha XeDKs shipped with an earlier BootROM version between 5.0.7f0 and 5.1.4f0. The BootROM is the stock ROM provided from Apple and does not have any special modifications. 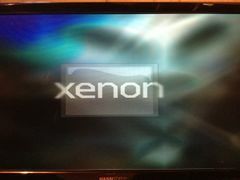 The Alpha XeDK operating system will run on any BootROM version and has been tested up to 5.1.8f7. Any claims that .elf support was removed in later BootROMs are false and there is no evidence to support it. Were the Alpha XeDKs liquid cooled? 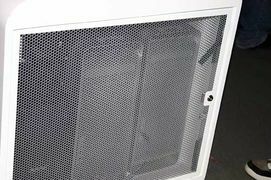 No, the dual processor 2.0GHz PCI-X and PCI-X 2 PowerMac G5 models from Apple were all air-cooled. Only higher clocked 2.5Ghz/2.7GHz PCI-X/PCI-X 2 models and later dual/quad-core PCIe models were liquid cooled. Any claims that the Alpha XeDKs were liquid cooled or that buyers "need to check for liquid residue from liquid cooling leaks" are false. What controllers work with an Alpha XeDK? A wired Xbox controller is required for use with an Alpha XeDK as there is no RF board present. You can not use a wireless controller with a play and charge kit with it as they still require an RF board. Either a wired Xbox 360 or Original Xbox controller will work (original Xbox controller will require a USB adapter). Wired krypton controllers will also work. 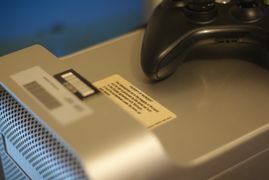 If you want to use a retail wireless Xbox 360 controller then you will need a USB wireless receiver normally used to connect the controller to a PC. Is a network card required for the Alpha XeDK to operate? A network card is not required for the Alpha XeDK to boot and operate although many features such as remote debugging and Xbox Neighborhood will not work. Is there a foolproof way to identify whether an Alpha XeDK is fake? No. All parts used in the Alpha XeDK are off the shelf and any labels can easily be recreated. There is no custom Microsoft-specific hardware in the machine. Can the Alpha XeDK connect to Xbox Live or Partner Net (PNET)? Similar to the Beta XeDKs, the Alpha XeDK used a pre-production version of Xbox Live that is no longer active. Can the Alpha XeDK run original Xbox games? Yes. The full emulator seems to be present although with some graphics limitations such as the lack of anti-aliasing and textures being limited to 2048. Can the Alpha XeDK run Xbox 360 games? The Alpha XeDK can not run XEX2 based applications. Even applications designed for the Alpha XeDK may not run on your specific recovery due to the rapid changes the that kernel went through. Is there an SDK for the Alpha XeDK? It is probable that one exists but it hasn't been seen or shared publicly. Does the Alpha XeDK have a retail dashboard? Yes. 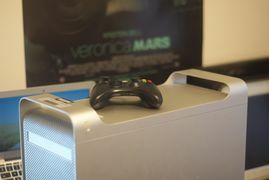 Similar to Beta XeDKs, the Alpha XeDK has a full version of the early "blades" dashboard although many features do not work due to the lack of Xbox Live connectivity. Is there a remote recovery for the Alpha XeDK? Yes and no. There are leaked remote recoveries such as the 0615 remote recovery but they are very specific on how far you can upgrade/downgrade at any given time due to the updater application being incompatible on later or earlier kernel versions. For example, the 0615 updater is too old to be run by the 1529 kernel, therefore you can not downgrade from 1529 directly to 0615 using a remote recovery. 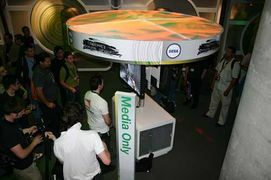 The E3 2005 Xbox 360 Kiosk (with a fake Xbox 360 being displayed). This kiosk was actually being run by an Alpha PowerMac G5 inside the cabinet. The true hardware running the E3 2005 kiosk. An XShell showing the 0198 recovery. 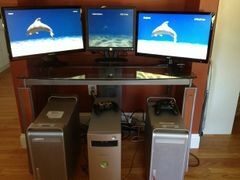 The two Alpha XeDKs (and original Xbox Alpha kit) previously owned by Syclopse. 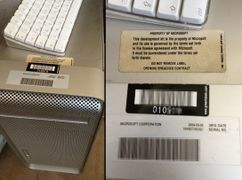 A closer look at the Microsoft branded stickers including the AK1-00001 sticker that was placed on the shipping box.